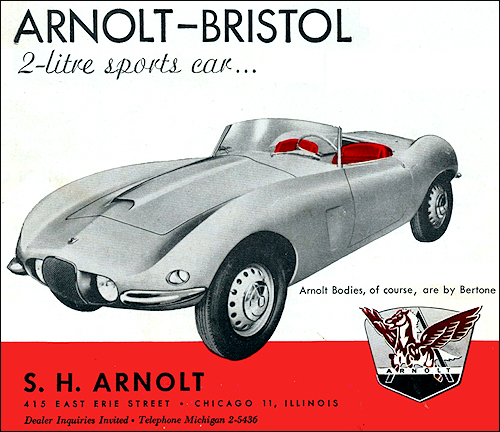 Type coded 404/X by Bristol, Arnolt Bristol is a roadster bodied by Bertone to three Arnolt specifications. Finished vehicles are shipped in to the USA. Specification names are Bolide, DeLuxe and DeLuxe Coupé. 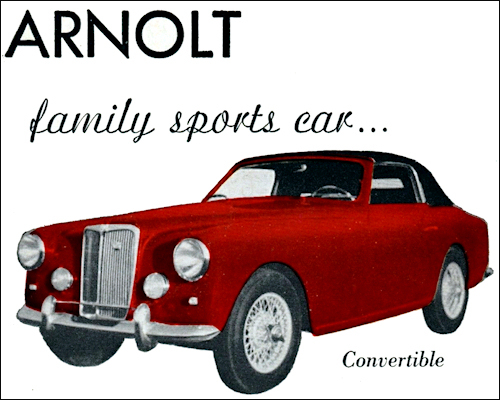 Bertone produced 103 Arnolt-MG -67 coupès and 36 cabriolets - between October 1952 and May 1954. S. H. Arnolt of Chicago, famous for a lot of new ideas in the sports car field, had one of the most interesting stands of the entire show. Highlight was a truly aerodynamic body by Bertone on the Alfa Romeo Sprint chassis with 1900C engine. Known as the BAT 5, this experimental machine has previously been described in The Autacar. 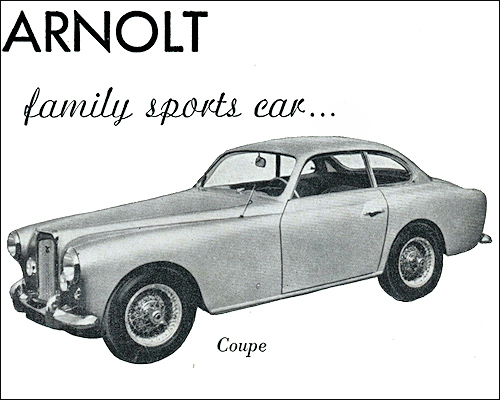 Other Arnolt exhibits included a maroon DB 2-4 Aston Martin Coupé with the new 3-litre engine and a buff-coloured Arnolt-M.G. sports saloon. The four-cylinder, 500 c.c. double over-head-cam J.A.P. engine putting forth 65 b.h.p. at 7,000 r.p.m.